In fact, the company included only one fix in the update. Apple developers patched the vulnerability used by the Pangu team for jailbreak. So far, no other improvements or enhancements have been found. 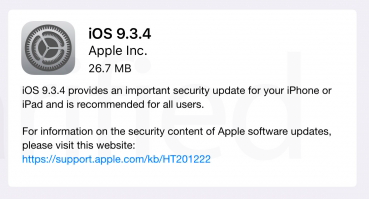 You can read more about the security content of iOS 9.3.4 on Apple’s dedicated webpage. If you don’t need the jailbreak, you can update your device either via iTunes or right from the phone or tablet via the Software Update mechanism.